Abbe Sensei taught both Judo and Aiki Jutsu at The Hut, Hillingdon in the UK since the 1950s and after his return to Japan the Renown Society was formed in 1966 by Sensei Ken Williams. This was the original* society teaching Aikido in the UK. The Renown Society broke up in 1969, however in 1973 at the request of senior ex-Renown Society Instructors, Sensei Haydn Foster formed the Institute of Aikido based at The Hut Dojo, where he taught ever since. 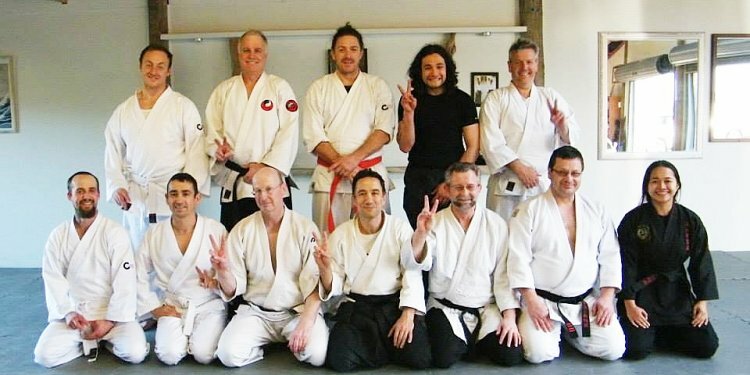 The Institute of Aikido now has affiliated clubs throughout the world. There is still some uncertainty as to who was the first to practise/teach Aikido in the UK but the information above comes from "the horse’s mouth" ie people who were actually there at the time. If anyone out there knows better please let us know. Sensei Haydn Foster, who until his death in 2011 was Principal Coach of the Institute of Aikido, began his Aikido career in the 1950s being awarded 1st Dan by Abbe Sensei in 1960, 2nd Dan by Nakazono Sensei in 1962 and 3rd Dan by Noro Sensei in 1969. The style of Aikido practised by the Institute of Aikido comprises traditional Aikido combined with a comprehensive use of the Jo and Bokken. The resultant blending of the mental, spiritual and physical attributes of the practitioner provides a sound, self defensive martial art whilst maintaining the flowing circular movements synonymous with traditional Aikido.